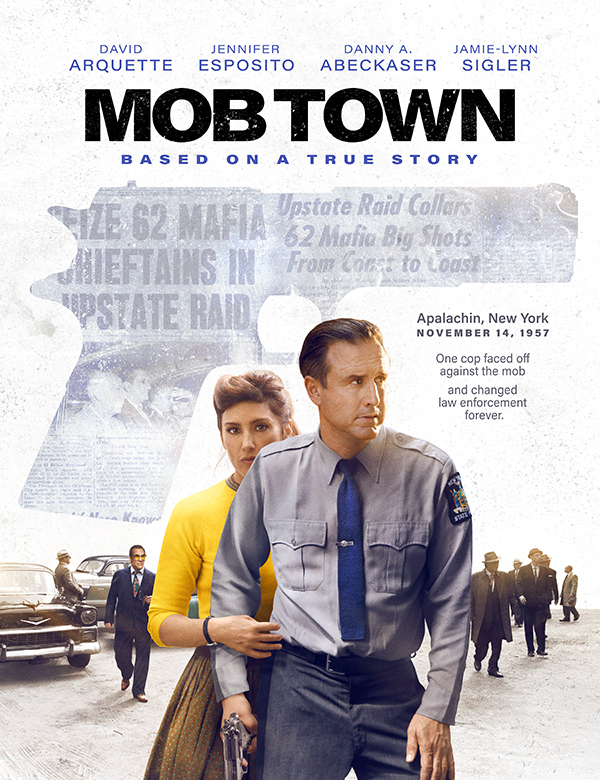 Based on the true story of the notorious 1957 “mob summit” in upstate New York. Spearheaded by Vito Genovese, more than 50 leaders of the organized crime syndicates from around the country converged on the sleepy town to discuss upcoming expansion plans. Their plans are foiled when local police trooper Ed Croswell discovers their activities and, consequently, exposes the mob to the American public. Croswell’s actions shed light on the massive web of corruption and changed the face of law enforcement forever. Starring David Arquette (“Scream,” “Bone Tomahawk”), Jennifer Esposito (Oscar winner “Crash,” TV’s “NCIS”), Jamie-Lynn Sigler (“The Sopranos,” “Entourage”), Danny A. Abeckaser (“The Wolf of Wall Street,” Martin Scorsese’s upcoming “The Irishman”), P.J. Byrne (“Big Little Lies,” “Rampage”) and Robert Davi (“Die Hard,” “The Iceman,” “The Expendables 3”). Copyright @ 2016 Bleiberg Entertainment. All Rights Reserved. Designed by Polaris Blue.